Today’s blog was written by AllergyEats’ team member, Adrienne Walkowiak, who recently experienced life at sea with a food allergy. 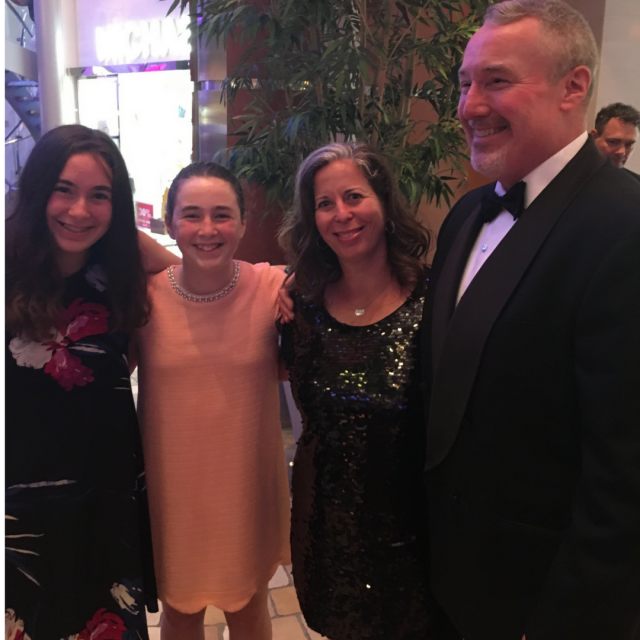 Dairy-free diner, Adrienne, and her family aboard Royal Caribbean’s Allure of the Seas. Royal Caribbean’s Allure of the Seas was so amazing at accommodating my food allergies that, upon my return from the cruise, I needed to wear baggy pants! I have a dairy allergy and I only eat at restaurants that can accommodate this dietary requirement. Until my recent February vacation, I had never been on a cruise before. Prior to our departure, I worried that I’d be out to sea with nothing I could eat. My travel agent assured me that the cruise ship’s staff could accommodate me, and she notified them in advance of my allergy. I received a “form letter” via email telling me that they knew about my allergy and that I’d be all set, but I still didn’t know what to expect. On the first day, at the first meal, I informed my server about my dairy allergy. He immediately got the head waiter, Jerome, who quickly became my new best friend. Jerome asked me what I wanted to eat for dinner, and I asked him what I could have. Typically, when I dine out – even at allergy-friendly restaurants – I have limited choices around what I can order. At dinner that first night, Jerome told me I could have whatever I wanted – that they’d make it special for me. And make it special they did! At every meal, they treated me like a VIP. Each night, I’d place my order for the next day’s meals and Jerome (who took care of me every day) would personally bring out my allergy-friendly meal, confirming as he served it that it was dairy-free. I imagined that I’d be “stuck” eating simple foods – turkey sandwiches are my typical go-to at restaurants – but the meals they prepared were sensational, going way beyond a simple sandwich. I had delicious prime rib for dinner one night, and lobster tails the next. They made me a grilled shrimp dish on a separate surface, away from where they prepared other guests’ buttery shrimp dinners. When I asked them to “surprise me” one day, they brought out four (FOUR!) plates of dairy-free food, so I was sure to have something I’d like. At breakfast and lunch, they offered enormous buffets, but I was afraid to eat from them in case of cross-contamination. I’d go to the restaurant with my friends and family and while they helped themselves to the buffet offerings, the chefs made my meals separately to minimize the cross-contamination risk. Keep in mind that the dining rooms were huge and crowded, but the staff never once made me feel like I was being an imposition. Amid all the chaos of busy shifts, they happily made my special meals and had the head waiter deliver it personally every time. Over the course of my week-long cruise, I ate short ribs, steak, swordfish, shrimp cocktail, Pad Thai, a ham omelet, pasta primavera, pork tacos, and so much more. Everything was delicious and I didn’t have a single reaction to any of the food. As someone with a dairy allergy, I’m rarely able to eat dessert when I dine out. Some restaurants have sorbet, but other than that, I’m usually out of luck. On the Royal Caribbean cruise, they served me desserts every day – and not once did they serve me sorbet. My favorite was a delicious dessert that tasted like a chocolate cloud – I’ve never had anything like it. I also got amazing meringues topped with a sweet strawberry sauce, chocolate cake and more. I was able to join my dining companions for dessert each night, which is something I’ve never experienced before. The Allure of the Seas staff was incredibly knowledgeable about food allergies, and were beyond delightful about making special accommodations for my dairy-free meals. I ate at the same restaurants for my meals all week, and was able to have the same servers throughout the week, so they knew me and understood what I could (and couldn’t) have. They treated me like royalty, knowing my name and my food allergies from day one. And when I commented that I especially enjoyed something (like that incredible chocolate cloud dessert, which changed my life for the better! ), they’d serve it to me again later in the week. The servers were absolutely delightful – even hugging me when I entered and exited the dining room for each meal – and they made me feel like it was their privilege to accommodate me, rather than a tedious chore like I get at some restaurants. I came home from the cruise completely satisfied – and needing to wear loose-fitting clothes. I would absolutely sail with Royal Caribbean again, and I’d enthusiastically recommend Allure of the Seas to the food-allergy community. And when you go, get that chocolate cloud dessert – you’ll be glad that you did! A note from AllergyEats: While our app and website are focused on dining out at restaurants in the U.S., many of our users exchange information about cruises, hotels, stadiums, theme parks and other public venues in our Facebook group: Dining Out with Food Allergies. We encourage you to share all of your food allergy experiences with other food-allergic diners by rating restaurants on AllergyEats and by engaging in our social media forums. Thank you so much for this! We’re going on a Disney cruise in two weeks and I feel relatively comfortable with Disney, but I was wondering about how other cruise lines handled it. My son has multiple allergies, and Disney cruises aren’t really in our budget range most of the time. I’m THRILLED to know we have another option! Thank you so much! This is very pertinent information! My husband and I are sailing on Carnival as first timers and I’m the one with SEVERE food allergies. I won’t tell him but I have been a little apprehensive not knowing just what to expect. Our Carnival travel agent assured me everything would be alright, the staff and chefs would know in advance, but I’ve heard that before. Your account has given me hope for a fun and enjoyable experience. Like you, salad and turkey sandwiches are my go to. Now I’m excited beyond belief! Thank you so much for this review! My daughter has a severe food allergy to all rice products-rice, rice flour, rice wine vinegar, etc. It is a strange allergy and most restaurants can’t accommodate us, telling me things like “We don’t put rice in our pasta…” I have been thinking that a cruise would never happen because of this, but you give me hope. Thanks again. We have sailed on Royal Caribbean multiple times on multiple ships with our food allergy son and have had great experiences. We actually sat next to a couple on one ship who also have a son with food allergies. They said Royal Caribbean gave them a tour of the kitchens to show them where they make his food separately. We just got back from a week on Norwegian Cruises and they were very accommodating as well. So nice to read. I have always assumed I could not cruise due to all my food allergies! How wonderful to read that it IS indeed possible. Thanks so much for sharing! We went on Disney Magic with all nuts, sesame,seafood and dairy allergies. No problems and service was great. My son has severe allergies to peanuts, tree nuts, seafood and shellfish. We have been on four Carnival Cruises and they take amazing care of him! Each night the hostess in charge of special diets comes over and plans his meals for the next day. When we first started going he was quite young so it was pizza, chicken fingers, and fries with cookies for dessert. He is 11 now and they make him steak, pork chops, chicken and he can often have appetizers such as meatballs and soup. He loves the chocolate dream cake for dessert! He also loves the pancakes or waffles with sausage or bacon for breakfast. The hostesses and waiters always treat him so well and take special care of him. He feels like a star! We have also been on two Princess cruises and they cooked him safe meals as well. At the beginning of the cruise they baked him a special tray of cookies and muffins that we kept in our room for snacks. They made him a safe birthday cake as well when he turned six. We’ve sailed Carnival twice now and they are just like your story, going above and beyond, treating my daughter very special. My daughter has a peanut/egg and shellfish allergy its such a relief to not worry so much about if she’ going to get sick. Thanks for sharing your experience. We had a similarly positive experience on the Norwegian Breakaway. Our son has a tree nut allergy so dining out is always a challenge. He was the happiest 8-year-old! They treated him like a King. He could have anything he wanted and they never made him feel as if it was an imposition. Can anyone comment on what they did to accommodate food allergy concerns while in ports? I’m being told by Royal Caribbean that they cannot provide any food to be taken off of the ship to be eaten in port and they cannot accommodate food allergies while in port.